Under New York Insurance Law § 3105, insurers have an out. If you materially misrepresent something when buying insurance, the insurer can get out of the contract. That’s valuable to insurers as it transfers the risk of loss when the insurer was induced to issue a policy based upon false information. In Ambac Assur. Corp. v Countrywide Home Loans, Inc., however, an insurer sought to take the operation of section 3105 beyond voiding a falsely procured policy. Ambac, a financial guaranty insurer, brought an action against Countrywide to hold it liable for falsely inducing Ambac to irrevocably guarantee 17 residential mortgage-backed securitizations. 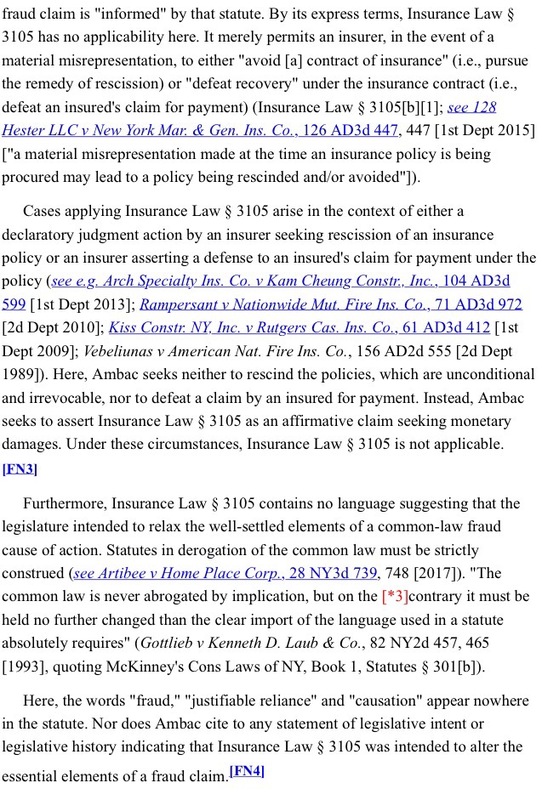 On summary judgment, Ambac argued that Insurance Law § 3105 dispensed with the common-law requirement of proving justifiable reliance and loss causation to succeed on its fraudulent inducement claim. This is only the latest in a recent line of fraud cases that the First Department has decided involving the failure of residential mortgage backed securities. Although each of these cases seem rightly decided to me, a credit to the First Department’s panels in handling these complex issues, I wouldn’t be surprised to see the Court of Appeals take one or more of these cases to provide certainty in this emerging area of the law. The First Department’s order can be found here.